Welcome to Worship Library, you are only a few steps away from full access to this cornerstone of Christian worship resources. Scratch the box on the back of your Pre-Paid Card and verify the code below to activate your membership. You will then be prompted to create a username and password for your account. If you have any questions or concerns before starting your subscription, our support team is here to assist you via email at support@worshiplibrary.com or toll free at 1-855-548-8749. Please note that your WorshipLibrary subscription is a lifetime membership, valid for a single individual and is non-transferable and not-resellable. Prepaid Card Code What's this? 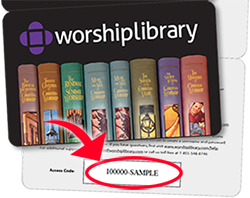 If you have a promo code or have purchased a WorshipLibrary subscription from your bookstore, library or online and received a pre-paid registration code, please enter it here. For some schools, the library content on this site is part of the curriculum. Contact your university professor to see if your school is participating, or to ask them to join in.